After having been made available for iPhone users since December, as we reported, the hands-free approach to writing e-mails is now available for BlackBerry users. With Nuance's Dragon Dictation, composing an e-mail is as simple as can be. Press a button, dictate a few words and check to make sure it has been transcribed correctly. The speech to text process takes about 5 seconds. The company behind this app is Nuance, a firm known for producing the hands free dialing technology in many of today's cellphones. 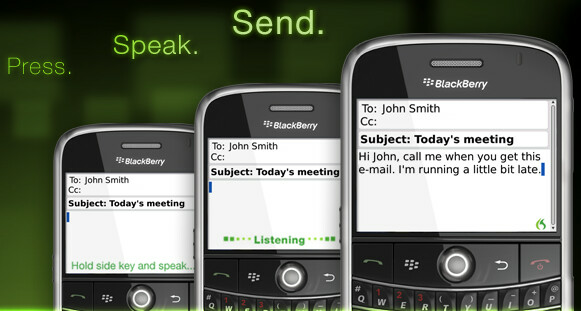 While the iPhone version of Dragon Dictation includes support for dictating a search engine request, or for writing a memo hands-free, the BlackBerry app works only on e-mail and is available free at BlackBerry App World, although the company says that it might start charging for the software down the road.